Mish's Global Economic Trend Analysis: 10-Year Treasury Yield Up 100 Basis Points Since May; What's That Mean for Mortgage Rates and Housing Affordability? 10-Year Treasury Yield Up 100 Basis Points Since May; What's That Mean for Mortgage Rates and Housing Affordability? 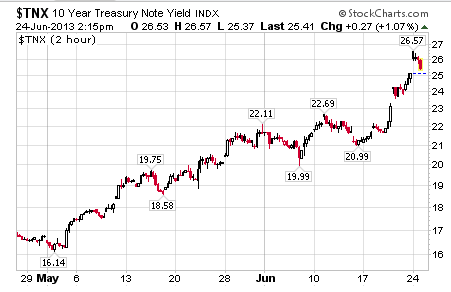 Curve Watchers Anonymous note the yield on the 10-year treasury note hit as high as 2.657% today, up a whopping 104 basis points since the early May low in yield of 1.614%. The 10-year yield has been falling since the open today, but the overall rise since May has clobbered mortgage affordability. As bad as Treasuries are selling off, the sell off in MBS is much worse. I looked at some charts this morning and the prices of Fannie Mae and Ginnie Mae coupons continue to drop. The FNMA 3.5 coupon was trading at 106 22/32 on May 2nd, and this morning it was trading at 99 9/32. Ginnie Mae is worse. The GNMA 3.5 coupon was trading at 109 1/32 on May 2nd, and this morning it was trading at 99 24/32. In terms of interest rates, I locked an FHA purchase on May 2nd and the rate was 3.25%, and that rate carried a 2 point lender credit to help pay for closing costs. In order to get the same deal today, (a 2 point lender credit) the rate would have to be 5% today. This as an apples to apples comparison illustrates that FHA rates have increased 1.75% in 7 weeks. You could get 4.625% on an FHA purchase, but you wouldn't get any closing cost help. I was locking well qualified borrowers at 3.50% on conventional loans (Fannie Mae) at the beginning of May, and now they are looking at 4.875%. Most of this pain has occurred since the FOMC meeting last Wednesday, and I am sure the talking heads at CNBC have no idea how much interest rates have spiked. They keep saying that housing is strong enough to withstand this rise in rates, but I think they are deluding themselves. I have people who I pre-approved for a mortgage early last week prior to the FOMC meeting, and now that they are getting their contracts accepted and ratified are shocked to learn mortgage rates have spiked one percentage point in just the last few days. A one percentage point rise in rates affects affordability by 10-11%. With mortgage rates up 1 3/8 to 1 3/4 points, that equates to a rise in monthly payments (or a drop in affordability) by as much as 17%. Anyone who stretched to buy is no longer qualified unless they locked some time ago. Refinancing will soon be dead in the water (anyone who has not already locked no longer has any incentive) and new home affordability has taken a big hit. Mainstream media talking heads say this will not affect the housing recovery. Assuming this trend sticks (even if rates simply level off now), how can this bond revolt not affect housing?